Today on the Veg - stage dives. We'll start with one from on high. Warning: diving into an empty audience will result in broken legs. Just because you're Kurt Cobain, don't think you can get away with this crap. Arthur Askey invents the mosh pit. It looks to me like he hits the floor on this one. 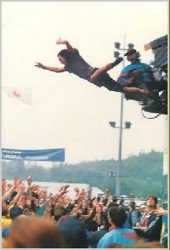 Eddie Vedder hijacks a camera crane. My nomination for Dad of the Year. if you're too fat to run, you're too fat to stagedive. you know what they say; it's not the fall,it's the sudden stop at the end thats the problem. said howardn2 on May 23, 2007 2:26 PM. Fun lunchtime veg! For some strange reason, that last video gave me a flashback to when I was in the mosh pit at a GWAR concert. said El Queso Grande on May 23, 2007 3:24 PM.